Heat oven to 375°F. In 10-inch skillet, cook beef over medium-high heat 6 to 8 minutes, stirring occasionally, until thoroughly cooked; drain. Stir in ketchup, mustard and onion. In small bowl, stir Bisquick mix and boiling water with fork until dough forms. Divide dough into fourths. On surface sprinkled with Bisquick mix, roll dough pieces in Bisquick mix to coat. Press each piece into 6-inch round, 1/4 inch thick. Spoon 1/4 cup beef mixture onto one side of each dough round to within 1/2 inch of edges. Top beef on each round with 1/4 cup cheese and 3 pickle slices. Fold dough in half, covering filling. Press edges with tines of fork to seal. On ungreased cookie sheet, place calzones. Brush with egg; sprinkle with sesame seed. Bake 15 to 20 minutes or until golden brown. 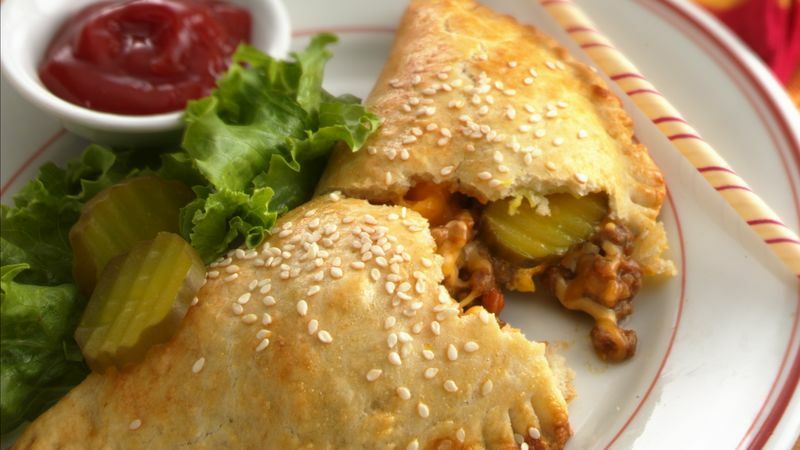 Top the baked calzones with more of your favorite burger toppings. Try lettuce, crumbled bacon, cheese and chopped tomatoes.